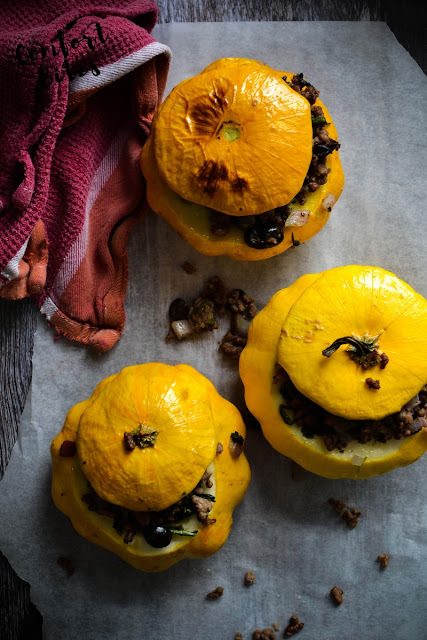 A beautiful autumn recipe of tiny patty pan squash roasted and stuffed with minced beef, bacon and vegetables. Filling, healthy - and a lower carb option to the classic Cottage Pie. This post contains some affiliate links. This means that if you click on the links and make a purchase, I might receive a small commission, at no extra cost to you, that helps me keep the blog running. Thank you for your support. So, the leaves are beginning to fall, all burnished and crispy, from the trees and I'm snuggled up by 8pm in my PJs watching My Fair Lady. It's autumn, all right. I've also noticed that I'm craving richer, filling comfort foods. And ordering a batch of winter squash in my veggie box. I love these Pattypan squash. They're so cute, like little chubby flying saucers. Split them in half across their bellies, scoop out the seeds and fill with minced meat and veg and you've got yourself a gorgeous, pretty much effortless meal. These stuffed squash are fairly low carb - well, less than mashed potatoes - and you can make up quite a few of these at once for a family meal. I've used a tasty combo of minced beef, black olives and herbs but you can add in your favourite ingredients if you like - tweak it to suit you. Preheat the oven to 200ºC/400ºF/gas mark 6. Gently cut into the squash, just above the middle and then lift off the top. Using a spoon, scoop out the seeds and discard. Place the 'lid' back on top of the squash and arrange on a baking tray. 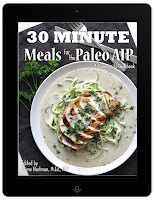 Rub with a little of the coconut oil and slide into the oven, cooking for 10-15 minutes, while you get on with the filling. Heat a large frying pan and add the pancetta and the beef. Stir-fry until browned and sizzling and then add the onion, olives and baby spinach. Season with a little salt and continue to cook, until the meat is cooked and the onion is softened. Stir in the parsley and turn off the heat. Take out the tray of squash, and lift each top with a pair of tongs. 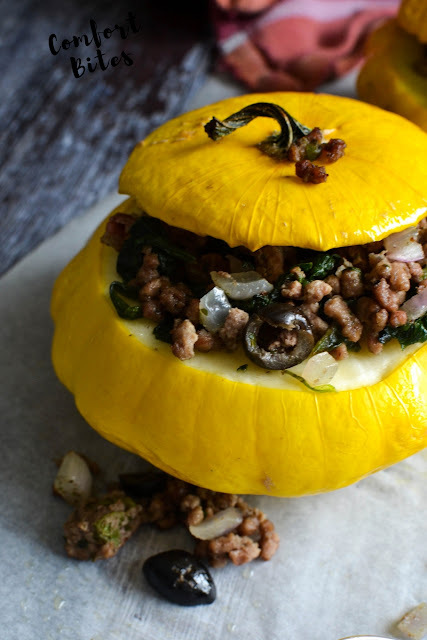 Using a spoon, fill each squash with the meat filling, until it comes to the top and then place the top of the squash back on. Slide back into the oven to cook the rest of the squash and let the flavours from the beef flavour it, about another 20-25 minutes. Once the cooking time is up, pierce the flesh of the squash with a sharp knife to make sure it's tender and then serve. Have you made this recipe? I'd love to see! Tag me on Instagram @joromerofood. love the flavorful seasonings you've added to that meat mixture!! Yum!